ELECTRONIC DEVICES STAY COOL: Sturdy and elegant bamboo vented lap desk/bed tray that helps keep laptops, electronic tablets, eBooks, etc., cooler due to the built-in honeycomb work surface that transfers heat away from the devices for greater airflow, thus extending the life of the components inside your electronics. 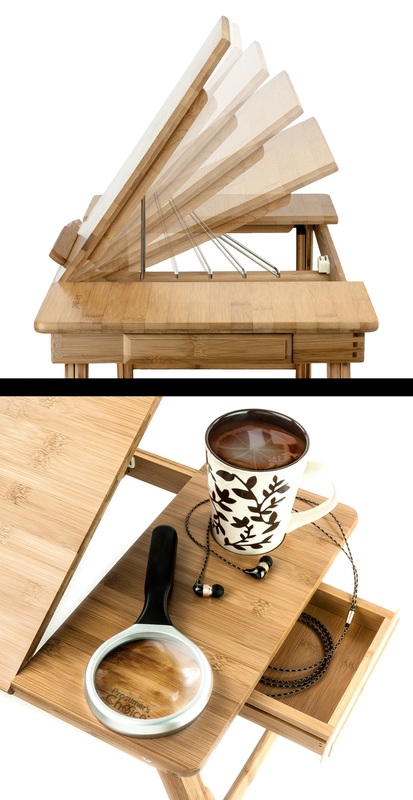 THREE-IN-ONE BAMBOO TRAY: Easily converts from a laptop desk, to a breakfast-in-bed tray, or standing desk, this three-in-one bamboo tray table lets you work or eat in comfort with less back and neck strain and even includes a recessed cup holder so your favorite beverage stays put. 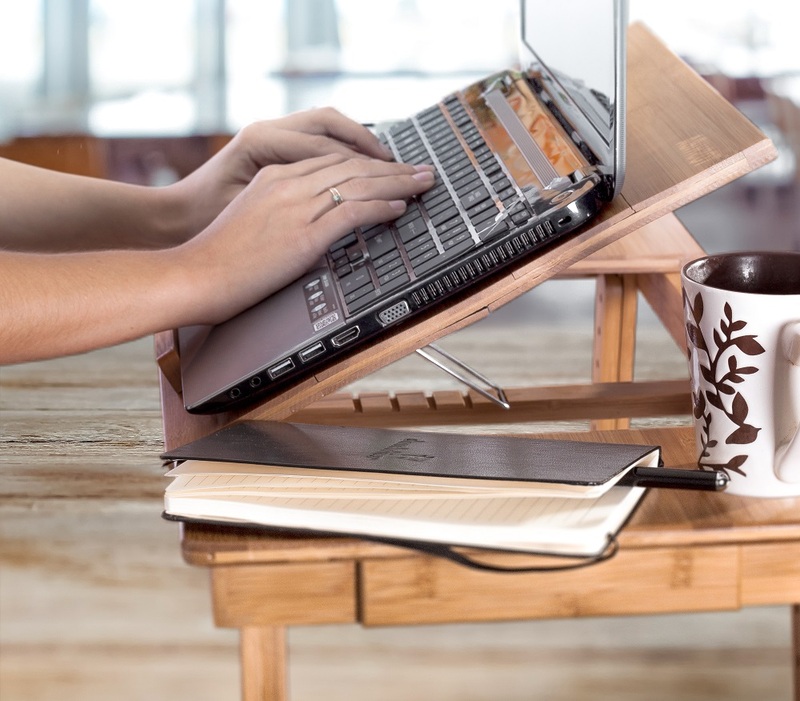 MADE OF ECO-FRIENDLY BAMBOO: An eco-friendly bamboo portable laptop desk/food tray manufactured in a facility certified as socially responsible by the Business Social Compliance Initiative (BSCI) and made of FSC (Forest Stewardship Council), Certified 100% natural bamboo harvested according to forestry standards from sustainably and responsibly managed plantations that support healthy eco systems. 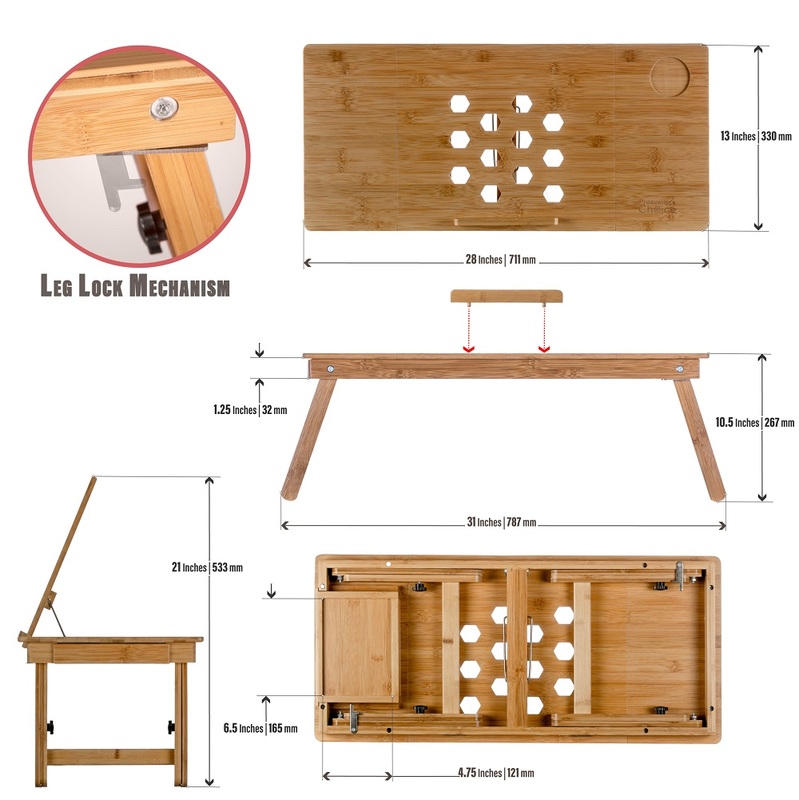 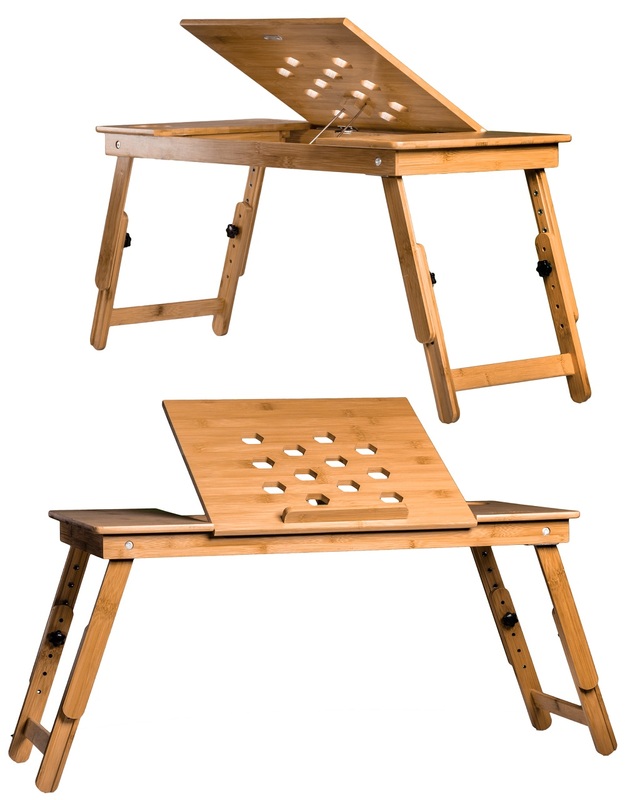 ADJUSTABLE WORKSTATION WITH CUP HOLDER: A left- and right-hand friendly eco-friendly table, includes a cup holder, large desktop work area and built-in drawer to store pens, notepads or cellphones and includes adjustable tilt and legs for the best viewing experience for laptops, desktop monitors, books, tablets and other devices. 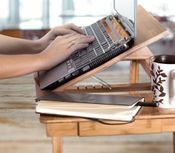 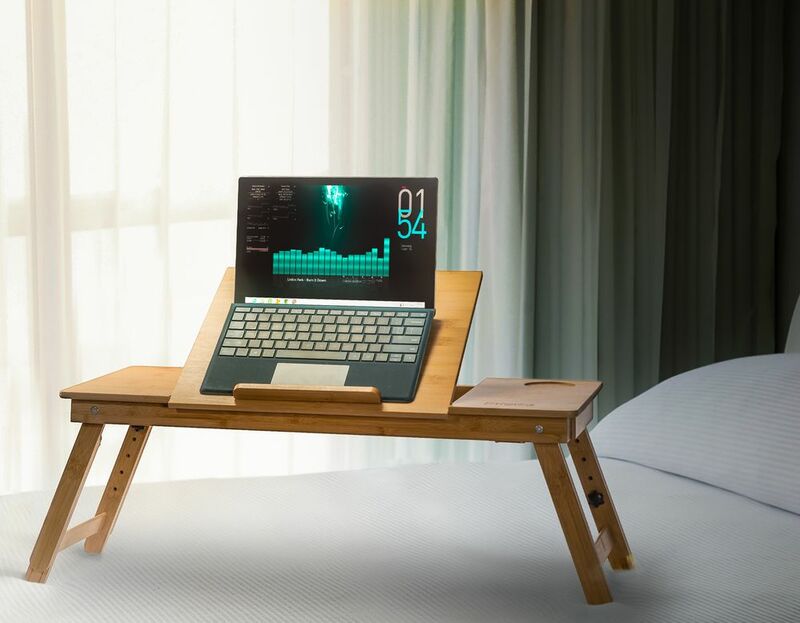 Prosumer’s Choice Natural Bamboo Air-Cooled Laptop Desk/Breakfast Tray with Honeycomb Cooling Vents is an affordable and practical addition to any home where laptops and tablets are used for working or reading on the sofa or in bed. Designed with multiple heat-dissipating honeycomb air vents that help netbooks, laptops and other devices that generate heat stay cooler, this vented laptop desk with cup holder is made of beautiful and eco-friendly bamboo wood and includes a convenient sliding drawer to store pens, cellphones and other handy necessities. 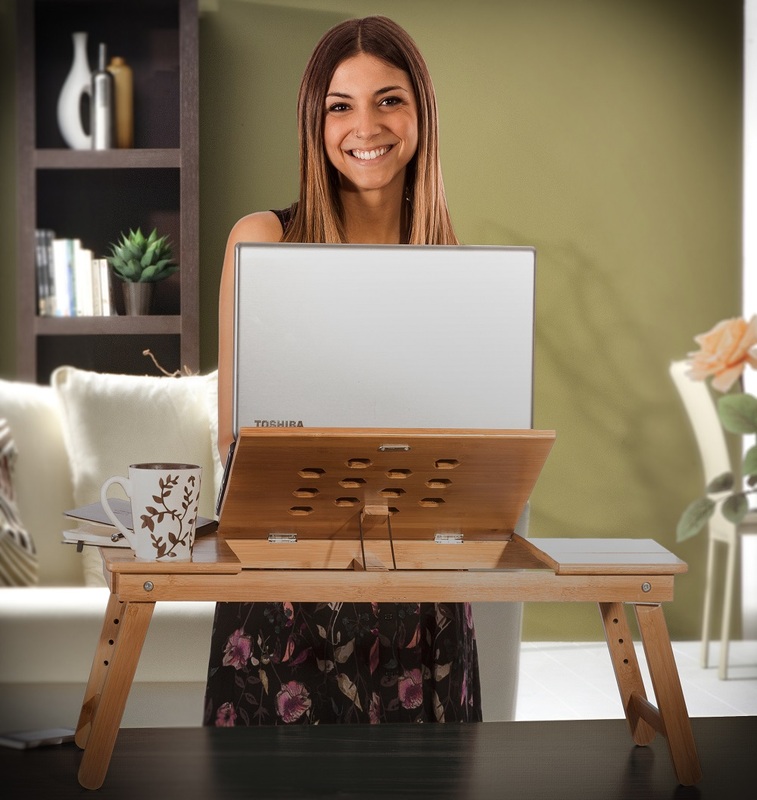 The versatile and ergonomic design lets you switch from a laptop desk stand, to a standing desk, to a breakfast-in-bed tray, and the adjustable tray and legs allow you to lock in the ideal viewing angle and height. 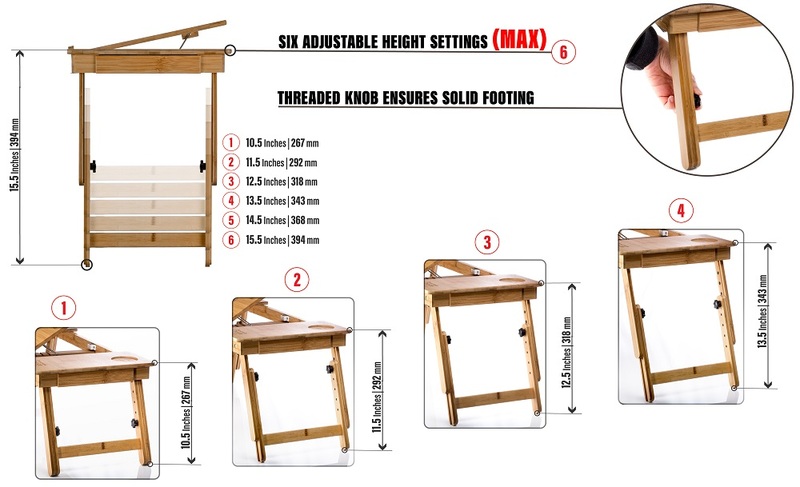 Ideal for children and adults and for both lefties and righties, this portable bamboo laptop desk is easy to assemble and folds up to stores easily for convenient access whenever you need it.